When I was growing up, I loved sitting down and watching football with my Dad. I flirted briefly with supporting Liverpool (the most successful English team of the time) but moved on quickly and my local team Wimbledon became my passion. Dad was a Spurs fan. His move from Ireland to England in the 1960’s coincided with the highly successful period they had with Bill Nicholson as manager. League Champions and FA Cup winners in 1961, FA Cup success again the following year and European Cup Winners Cup glory in 1963; in beating Atlético Madrid 5-1, they became the first British club to win a European trophy. Dad spoke of Danny Blanchflower, Cliff Jones, John White, Jimmy Greaves, Dave Mackay, as legends of that era. ‘The Tottenham Way’ was born – an exciting, attacking form of football that delivered success as well as an easy on the eye style. My earliest recollections of Spurs are their back to back FA Cup wins in 1981/2. Given my Dad’s support, they inevitably became my favourite ‘big team’ in England, attractive to watch in contrast to Wimbledon’s up and at ‘em style. 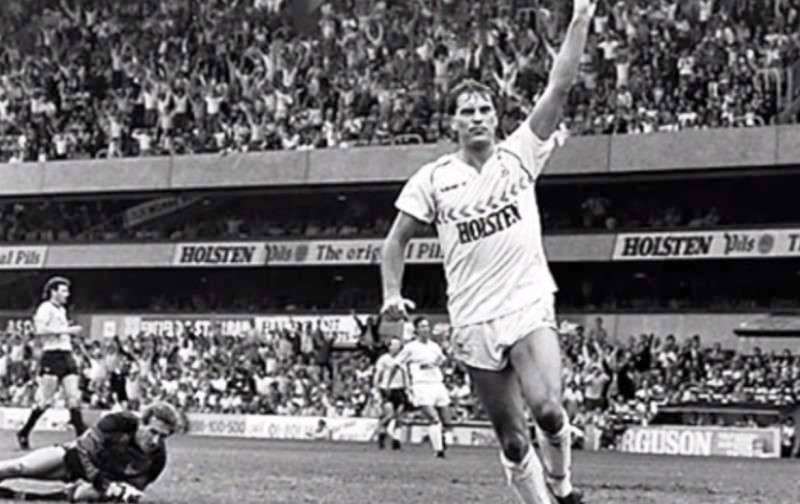 My favourite player was Glenn Hoddle, a tall, classy midfielder, equally effective with both feet. He could dribble, spray a wonderful pass, take a mean free kick and score exquisite goals. Shirt never tucked in, he was scruffy on the pitch but you couldn’t take your eyes of him. Glenn turned 61 yesterday. I randomly woke up at about 3am this morning and when I couldn’t get back to sleep, I picked up my phone to check some scores and see what else was happening. Glenn was working on his birthday as a pundit for BT Sport, when he suddenly collapsed. As I write, he is seriously ill in hospital. He amassed 59 England caps and 8 goals for his country. After Spurs, he played 69 games for Arsène Wenger at Monaco, before being appointed as player/manager of unfashionable Swindon Town. A three year spell in charge of Chelsea followed, before he took over as England manager following Euro ‘96. As the boss, Glenn largely promoted a 3-5-2 formation, largely bucking the traditional 4-4-2 that English clubs used. Soon after a second round exit to Argentina, the most controversial period of his career developed. Hoddle, a born again Christian, had given an interview to The Times where his views on spirituality were published; these included quotes attributed to him regarding disabled people. He sought to defuse the row by saying he was ‘so sorry’ and said his words had been ‘misinterpreted’ and ‘taken out of context’. He was dismissed by the FA for non-footballing reasons in February 1999. Spells in charge of Southampton and Wolves sandwiched his popular return to Spurs in 2001. A League Cup final appearance in 2002 was as good as it got though, and after a poor start to the 2003-04 season, he was sacked as Spurs sat in the relegation zone. In recent years, he has concentrated on media work and his own football academy in Spain, which concentrates on developing and assisting players who have been released from professional contracts, with a view to improving them and getting them back on that ladder. 61 is no age at all. I sincerely wish Glenn and his family the best at this difficult time and hope he makes a full recovery as soon as possible. If he’s as skilful in battling illness as he was on the football field, he’ll be fine. Get well soon, Glenn. From a lifelong Arsenal fan (hopefully all Gooners would feel the same. Rivalries are completely trivial when stuff like this happens). Thanks Paul. The reports sound positive, he’s making progress, so hopefully that continues.